Pack your bags for an unforgettable stay in Santa Fe! This welcoming and remote 1-bedroom, 1-bathroom vacation rental cabin sleeps up to 2 guests, making it a perfect retreat for solo travelers or adventurous pairs. 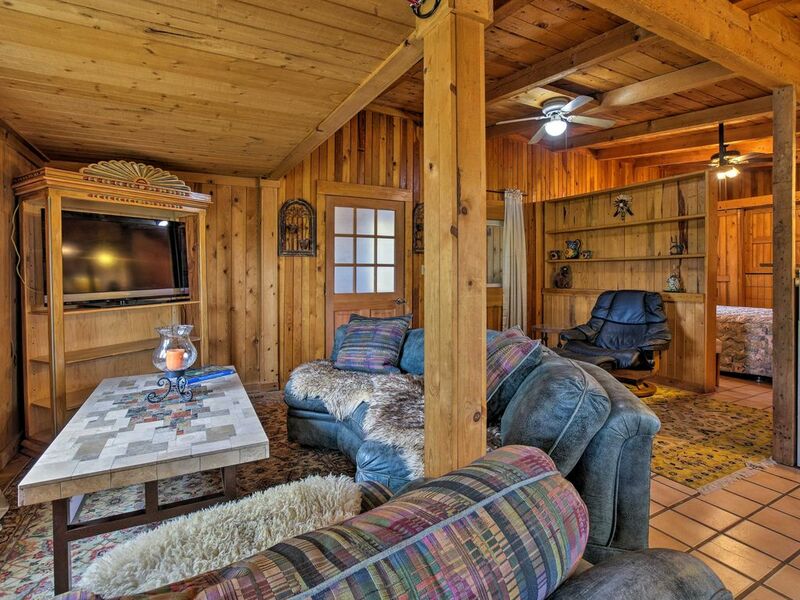 The property offers all the comforts and amenities of home, as well as access to some of the best skiing in New Mexico! Venture out to explore the sights and attractions, shopping and dining, and plenty of outdoor adventure! Embark on a hike in the mountains or golf nearby! Step inside this well-appointed cabin and settle right in among cozy furnishings and rustic accents. Connect to the free wireless internet access to search for a delicious local restaurant or other fun activities. If you choose to eat at home, the cooking-savvy traveler can whip up a family-favorite meal in the kitchen. Set the table and savor dinner together while you refuel for another day on the ski hill! When you're ready to retire for the evening, begin your nightly routine in the large full bathroom. Here you'll also find laundry machines to keep your hiking and skiing gear fresh. You'll love this ideal location in Santa Fe, offering easy access to a variety of sights, activities, shopping, and dining! When the snow starts to fall around Santa Fe (the 2018 season has been fantastic so far) locals flock to Ski Santa Fe - located 26 miles from your door! Situated on a quiet farm, you'll enjoy beautiful views of the mountains, rainbows, and of course the animals romping around. Hang out at the farm and walk the labyrinth or mingle with the goats. Enjoy close proximity to the city from the country-feel abode. Santa Fe offers something for everyone, including a fun arts scene. Be sure to visit Meow Wolf, featuring unique art installations with a mysterious narrative. The home sits 12 minutes from the Santa Fe Plaza, 10 minutes from the golf course, 15 minutes from the Santa Fe Regional Airport, 5 minutes from Meow Wolf, and 40 minutes from balloon fiesta in Albuquerque. Mary Ann is an awesome hostess. The place is nice and quiet yet close to most Santa Fe attractions.